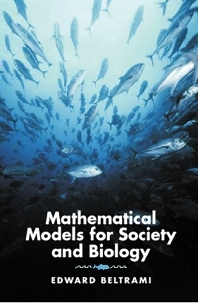 Mathematical Modeling for Society and Biology engagingly relates mathematics to compelling real-life problems in biology and contemporary society. It shows how mathematical tools can be used to gain insight into these modern, common problems to provide effective, real solutions. Beltrami's creative, non-threatening approach draws on a wealth of interesting examples pertaining to current social and biological issues. Central ideas appear again in different contexts throughout the book, showing the general unity of the modeling process. The models are strikingly novel and based on issues of real concern. Most have never appeared in book form. Through the relevance of these models mathematics becomes not just figures and numbers, but a means to a more refined understanding of the world. Beltrami is appropriate for readers interested in biology, sociology, public policy, political science, and mathematics as well as anyone interested in how mathematics can be used to gain, and convey, a greater understanding of biology and society. 8 Red Tides and What Ever Happened to the Red Squirrel?